where diners are ensconced in luxury and comfort as they enjoy the cuisine of chef Henk Savelberg. His culinary wizardry is evident on every plate as he offers a dining experience that starts from selecting and sourcing high quality raw materials from France, Netherlands, Canada and Thailand’s own produce from the Royal Projects. With the finest produce from around the world, the chefs craft outstanding dishes that can only be found at Savelberg restaurant. But with the dates emerging just around the corner, diners are ready to welcome these delicious and beautiful delights. 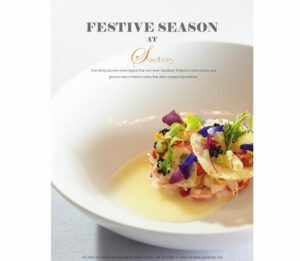 Christmas and New Year’s become more magical than ever when Savelberg Thailand’s chefs conjure up a glorious menu of festive dishes that utterly surpass expectations. Join us for a full program of season events and memorable dinners throughout December, and make it a season to remember! Turbot, Doe and other Savelberg Thailand signatures, on either the 24th or 25th December 2016. Celebrate the end of a great 2016 and a brand new start in 2017 with the top favourite dishes served at Savelberg Thailand throughout the year on 31st December 2016 and 1st January 2017. Available from 18:00 – 22:00 hrs. and are his signature dishes that bring Game, Wildfowl together with seafood like turbot, sole and oysters with caviar. A wide variety of tastes and textures can be experienced both at lunch and dinner with a choice of à la carte offerings or Set Courses. Created especially by Chef Henk Savelberg and his skilled team of chefs has meticulously prepared special delicacies and dishes to tantalize diners for Christmas and New Year’s celebrations.